In update 1, the static and dynamic link libraries for the CRT, STL and MFC have been updated in-place to add runtime support for Windows XP and Windows Server 2003. And the runtime version is upgraded to 11.0.51106.1 from 11.0.50727.1. Except the library update, there’s none real difference when selecting “v110” or “v110_xp” toolchain. I wrote a simple HelloWorld application and compare the two generated binary. I also built a simple MFC application(dynamic link to MFC) with Windows XP target in VS2012. It runs fine under Windows XP with MFC DLLs copied in the same directory. 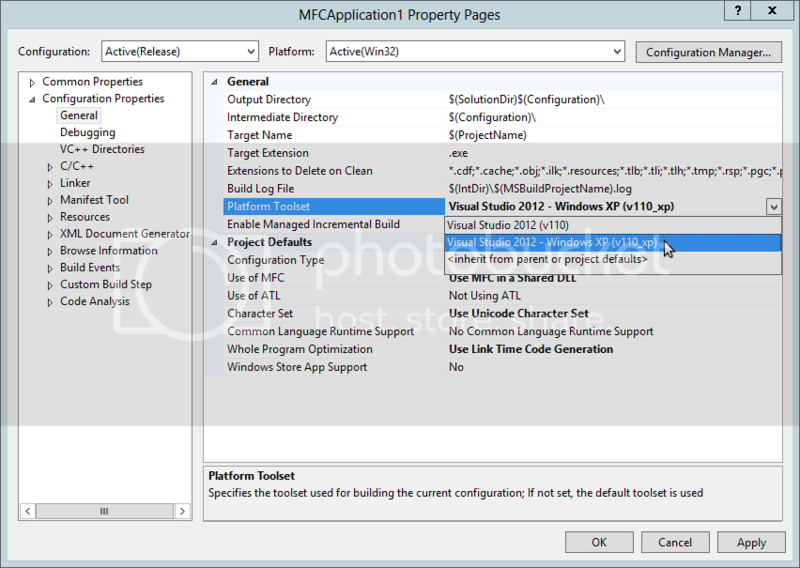 From VS2010, the SxS assembly is not used any more. All you need to do is copy the dependent DLLs to the application directory and run.